· Confirmation is made only upon receipt of full payment. · Any refunds incur a 5% banking charge withheld from the total refundable amount. · If cancelled up to 8+ days before arrival – refund given excluding 1st night plus 5% of total charge. · If cancelled 7 days or less prior to arrival 100% total cost of the reservation. · Shortening a stay after arrival is the same as cancelling within 7 days of arrival date. · In the case of no-show, no refund will be given. · A group reservation is deemed to be any reservation of 8 or more guests. · If cancelled up to 31+ days before arrival – refund given excluding 1st night plus 5% of total charge. · If cancelled 30 days or less prior to arrival 100% total cost of the reservation. Check in is from 14:00 and Check out until 10:00. Let us know if you would like to check in earlier, we will try our best to accommodate you. Late check outs may be arranged where possible, please let us know in advance. The reception is open daily until 8pm. Kindly notify us in advance should you require a late check in and we would be happy to arrange this. Maximum occupancy in a room type is shown at the time of securing the reservation. Additional guests (including children) are only to be added to the reservation by prior arrangement with the lodge and may incur an additional cost. The weekly rate applies to consecutive nights in the same room type only. A room change will result in the lesser priced room/bed for that week being free of charge. Children (under 16 years) can only be accommodated in a private room or private dormitory and must be accompanied by an adult. Children are not allowed to be accommodated in mixed dormitories. Children 4 years of age and under are free of charge. Children 5 years of age and older must have a bed booked for them. Payment is required to obtain a confirmed reservation. Please read the cancellation policy before making a reservation request. Room Rates may change without notice and may vary for special events except for confirmed reservation (payment secured). Check-in is from 14:00 and Check out until 10:00. Let us know if you would like to check-in earlier, we will try our best to accommodate you. Late check-outs may be arranged where possible, please let us know in advance. The reception is open daily until 8pm. Kindly notify us in advance should you require a late check-in and we would be happy to arrange this. A deposit is required to secure a confirmed reservation. Please read the cancellation policy before making a reservation request. Should there be an accessibility request (i.e. wheelchair accessible room), please contact us before submitting the reservation. Room Rates may change without notice and may vary for special events except for confirmed reservations (deposit paid). Jollyboys has been catering to travelers since 1995; we love Zambia and our community and we are happy to share our wealth of travel knowledge with our guests. Visit out our travel shop for great safari and activity specials as well as travel advice for Livingstone, Zambia and beyond! We go above and beyond to keep our guests happy; free daily shuttle to Victoria Falls, free pickup from Livingstone Airport and the Victoria Falls border, free weekly Livingstone town walk, to name but a few. 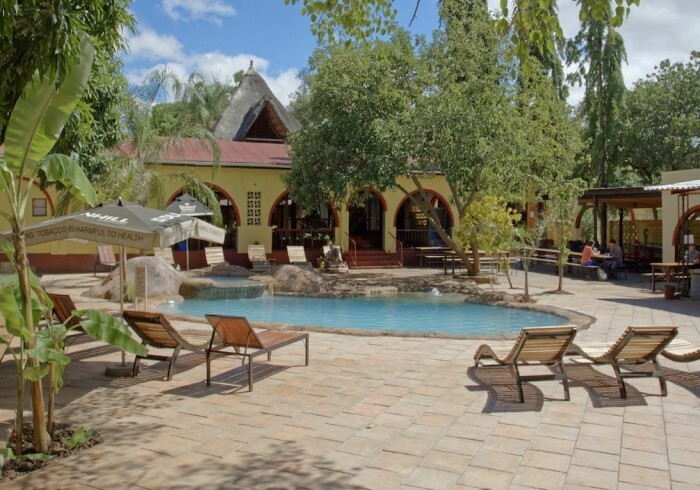 As Zambia's original backpackers lodge, Jollyboys continues to win numerous awards and is still arguably one of the best backpackers in Africa. Take a break and relax in our tropical gardens and gorgeous swimming pool whilst being just steps from the museum, markets, banks, and stores. The Victoria Falls - World Heritage Site - are only 8 kilometers away. After a day full of adventures and adrenaline; grab a homemade burger at the bar and swap stories and tips with your fellow travelers, whilst having an ice cold Mosi sundowner. Settle into a wide choice of cosy private rooms or dorms and enjoy a good night's sleep under a cushy duvet. Delicious, healthy smoothies, homemade pancakes or a big cooked breakfast await you, before starting another day of exploring and enjoying Livingstone. Be a part of our Responsible Tourism initiatives, check out our community projects, worm farms and composting food waste. Plastic bag and plastic bottle collection bins. Rest assured that African power cuts won't affect you hot water and electricity access; Jollyboys is powered by the rays of the beautiful and constant Zambian sun. Come and join us; let the Jollyboys Team welcome you with true, friendly, Zambian hospitality.